Freshly raw glazed jugs drying in the sun. My connection with ceramics now, as I look back, stretches further than I could have ever imagined in the days of my youth when I moved from sculpture to pottery. This early move from sculptural ‘art’ to pottery ‘craft’ was easy and natural, particularly as I saw no distinction between art and craft. 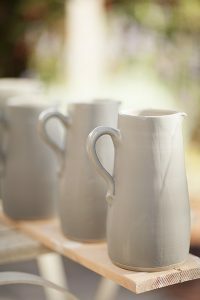 Over the years I have found that there is no distinction, Pottery is an art as rich and fulfilling as any other. All creative pursuits have qualities, pottery is an incredible field of endless subtlety and opportunities; the longer I work in it the more it surprises me. From the outset I was drawn to make functional table ware. This came from within but was assisted by contemporaries; local potters in Devon, (where I lived), Svend Bayer (from whom I brought my first wheel) and Clive Bowen and his earthenware slip decorated work. Later I was lucky to be taught by other luminaries like the inspiring Michael Casson OBE and other great potters too numerous to list. Although intuitive my ‘natural fit’ with functional simple pottery also links with the historical path of functional studio pottery in the west and the work and writing of Bernard Leach, Shoji Hamada, Soetsu Yanagi and then leading from these, Michael Cardew, Svend Bayer, Clive Bowen and Walter Keeler among others. Along this journey I received a BA hons degree in ceramics and art history, and later an MSc, but this was really only the beginning. I also went on to work at the Victoria and Albert museum, as you can imagine, a wonderful experience. I think creativity is really a developing journey, if we are lucky to be that way inclined, it accompanies us throughout. The work which inspires me is simple pottery both past and present from around the world. The pieces which touch me the most are filled with the humanity, love, care, generosity and unencumbered skill of the makers, they express the unmistakable qualities of the handmade and the heart. They are not self conscious or contrived, but simple, subtle and at ease. My current work is a continuation of my journey, lit by the above, it is resolutely functional and made to be used. I hope that my pottery fits naturally into the home and that the work touches people with daily use.